Continuing with our series of charts analyzing the Four C’s of Diamonds, we progress with this week’s breakdown of the most important C: Cut. Why is the cut the most important quality of a diamond? Well, it plays the biggest role in effecting the sparkle of the diamond, and let’s face it, the sparkle is a top priority for most. A good cut has the power to make a diamond of lower color and clarity look breathtaking. And yet, a diamond with the best color and clarity can look horrible if it has a terrible cut. The first thing to know is that the term “cut” is used in two different ways. Many people use “cut” when describing a diamond’s shape, for instance, an “emerald-cut engagement ring”. Though the term is widely used in this way, it is not really the correct usage. The true definition of cut is not the shape of the diamond, but rather the proportion, polish, and symmetry of the diamond. Diamond Cut Shape – The shape of the diamond. There are ten main types of cut shapes (Circle, Oval, Emerald, Radiant, Asscher, Cushion, Heart, Princess, Marquise, and Pear Cut). Diamond Cut – A diamond’s proportions, polish, and symmetry. When a professional jeweler studies a diamond’s cut, they look at a myriad of things, but in the most basic terms, their analysis concerns how the diamond reflects and refracts light. Brilliance – The white light reflection on the surface and inside the diamond. Fire – The flashes of color caused by the dispersal of light inside the gem. Scintillation – The flashes of light and dark (sparkle) when the diamond is moved. Very Ideal – Proportioned to return the greatest possible light. Ideal – Reflects almost all the light that enters the diamond. Very Good – Reflects almost as much light as Ideal cuts but a more affordable cost. Good – Reflects most of the light. Fair – Not as brilliant a cut, but still a decent diamond. Poor – Reflects low amount of light. These diamonds are not worth your time. 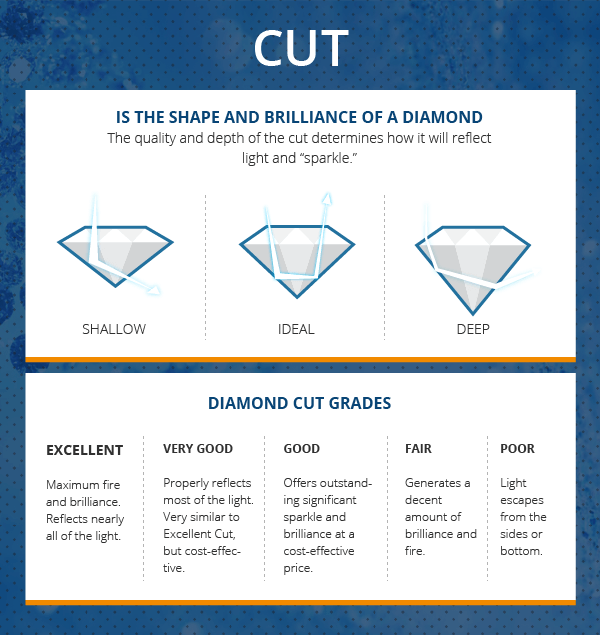 The chart below helps capture the science behind determining a diamond’s cut. Don’t Ever Buy Poor Cut – It’s not worth your time to buy a diamond that looks fake. 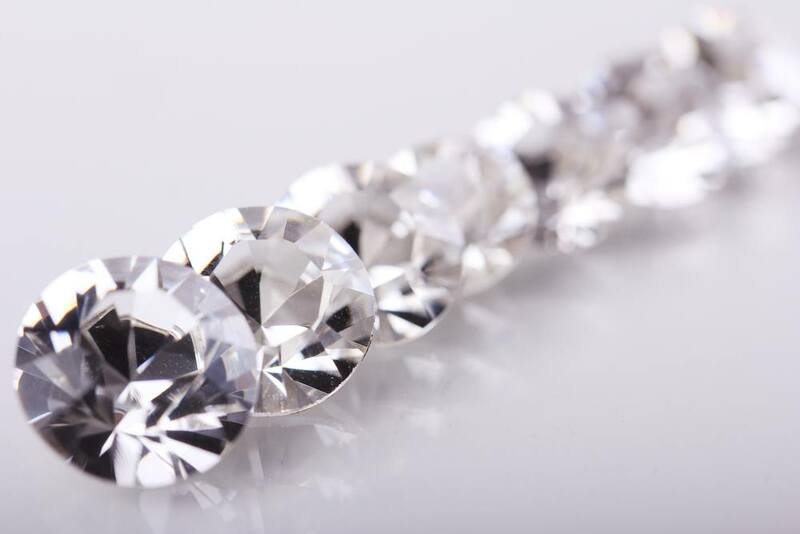 What Poorly Cut Diamonds Look Like – Poorly cut diamonds are dull and glossy. They just don’t shine the way well-cut diamonds do. Cut Effects Size Appearance – The more brilliant and vibrant the diamond, the bigger it looks. If there is anything to know about buying diamonds, it is that the importance of the cut is undeniable. You can shop for diamonds by cut on Brilliance.com today.